40V 20 IN. BRUSHLESS SMART-TREK™ Self-Propelled Mower is rated 5.0 out of 5 by 2. Rated 5 out of 5 by JTma from Works like a dream! I'm very excited about my new Ryobi mower. It's easy to start and adjust and runs quietly. It's lightweight but has heavy-duty power. The thing I like best part is it lets me do away with the hassle and maintenance of a gas mower. The Ryobi is just what I need to keep my lawn looking good! Rated 5 out of 5 by Brandi from Love this mower I just bought this mower had it for a week and I just love everything about so easy to use. No more fighting with gas and the pull string. I have arthritis and I can use the mower with ease. Will highly recommend. Exceptional performance. Powerful Innovation. Powered by an intelligent Series V Brushless Motor and a high-capacity 6.0Ah 40V lithium-ion battery, this mower delivers GAS-LIKE POWER™ and cuts up to a half acre on a single charge. 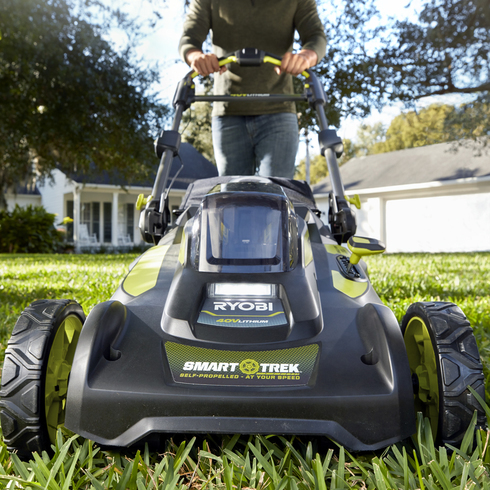 SMART-TREK™ Self-Propelled Technology intelligently and intuitively adjusts to your walking speed making your mowing experience exceptionally convenient. With the EASY LIFT SINGLE-MOTION RELEASE & LOCK BAGGER there are no more complicated procedures or acrobatics required. A quick pull up to empty and simple drop-in of the bagger gets you back to mowing faster and with less frustration. With its quick-release knobs and foldable handle, it’s perfect for compact storage but is always ready to go in seconds. Best of all, it’s simple to start. No more gas, oil or pull cords. Simply snap in a charged battery, set your cutting height with the 7-position single point height adjustment and push the button to begin mowing. SMART-TREK™ Self-Propelled Technology intelligently and intuitively adjusts to your walking speed. With the EASY LIFT SINGLE-MOTION RELEASE & LOCK BAGGER, no complicated procedure or acrobatics required. Simply pull up to release and drop it in to lock. This super high-capacity 40V battery delivers incredible power and up to a half-acre run time. Effortlessly adjust the cutting height for all four wheels with a single adjustment of the knob. The intelligent Series IV brushless motor delivers the power of gas with all the benefits of cordless.